International Work Experience Program at King’s - StudyinCanada.com! The I.W.E. 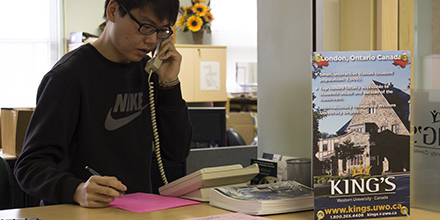 Program offers international students part-time positions on campus. The International Work Experience (I.W.E.) Program at King’s University College offers international students the opportunity to gain valuable work experience through an on-campus job in a variety of departments. The I.W.E. Program provides students with training and experience that will assist them in further studies and their eventual entrance into the workforce while earning a source of income. Yi Zhu, a second year student from China studying Business, Management and Organizational Studies at King’s, works in the Registrar’s Office as a Student Assistant. King's is a Catholic educational institution in London, Canada, affiliated with Western University. Founded in 1954, King’s provides general and honors degree programs in the liberal arts, social sciences, and social work, and a master's degree in social work. It is renowned as a centre of teaching excellence positioned in the top rank of institutions of higher learning in Canada for the quality of its teaching faculty.